El Portal Sedona Hotel – More Holiday Fun in the High Country! El Portal is the only Sedona hotel to offer on-site jeep tours with permits for off-road travel in the back country. Whether you’re looking for adventure, nature and geology, Native American history and culture, or spectacular vistas, Sun Country Adventures has the perfect tour for you. Exploring Sedona’s majestic red rock terrain with our specially trained Sun Country Adventures guides is an amazing way to see the surrounding area! Our mission at Sun Country Adventures is to delight and to educate guests. Our tours are customized to reflect the interests and desires of our guests. We offer half day and full day trips, and an incredible “Sunset Jeep Tour” – an unforgettable 2 hour jeep tour through some of Sedona’s most spectacular natural wonders, all at sunset! At Sun Country Adventures, in keeping with El Portal being a pet friendly bed and breakfast, you can take Fido out on a jeep tour too! We have had many a canine companion tour the back roads and high country with us! 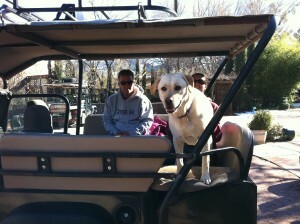 To reserve your tour, call El Portal, Sedona’s premier pet friendly hotel, at 1-800-313-0017.